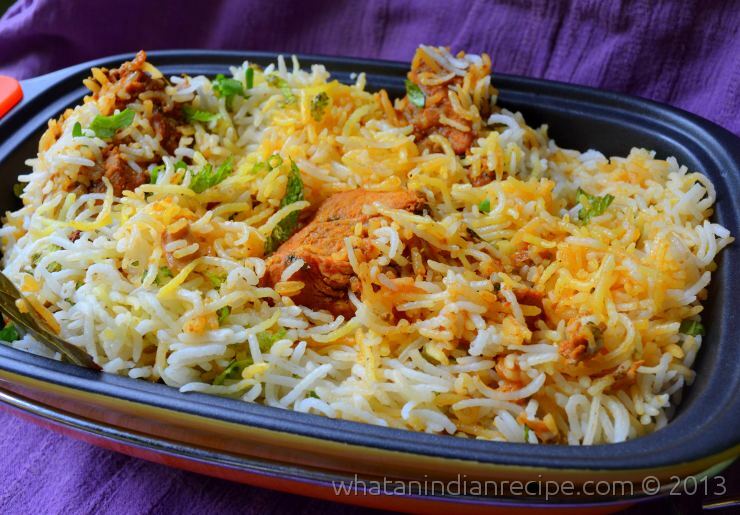 Biriyani is a very popular rice based dish in the Indian subcontinent, Hyderabadi Chicken Dum Biriyani is a variant, it’s delicious and can be prepared for lunch and dinner , also being worth the effort. The rice and chicken & masala are cooked separately and set together in a vessel and allowed to steam cook, this is called Dum. Clean the chicken pieces and keep aside. Soak the saffron in warm milk and keep aside. Fry half of the onion till brown and crispy, and drain it on tissue, grind it in a mixer along with saunf/fennel seeds. Apply this paste on the chicken pieces along with ginger-garlic paste, Kashmiri chilli, pepper, turmeric, coriander, garam masala powder, curd, salt , lime juice, half of the chopped pudina leaves & half of the chopped coriander leaves. Marinate it and keep aside for at least 1-2 hours. Meanwhile, soak the basmati rice in water for at least 20 minutes and drain it. Heat ghee in a pan, and add the remaining onions & green chillies and fry till the onion turns brown, to this add the marinated chicken and cook till tender, remove from fire. Boil water for the rice and add bay leaves, cloves, cardamom and cinnamon to it. Also, add a little bit of oil and salt. Now add the drained rice and cook till it is 1/3 done, and then drain the rice. Spread the rice on a big plate to let it cool down. Take a big vessel and apply some ghee on the bottom of it, now spread half of the rice on top of the ghee layer and then sprinkle half of the saffron-milk mix on it along with 1 tsp rose water. Now spread the the entire chicken curry on top of this and then again spread the remaining half of the rice over the chicken. Again, sprinkle saffron-milk mix and 1 tsp rose water on it and garnish with remaining chopped coriander leaves and mint leaves and close the vessel with a lid. Make a dough of wheat flour and then seal the sides of the vessel lid to prevent escape of the steam and then place the biriyani vessel on hot tawa and let it cook on very low flame for 25-30 minutes. Serve hot with raita and pickle.